Drs. 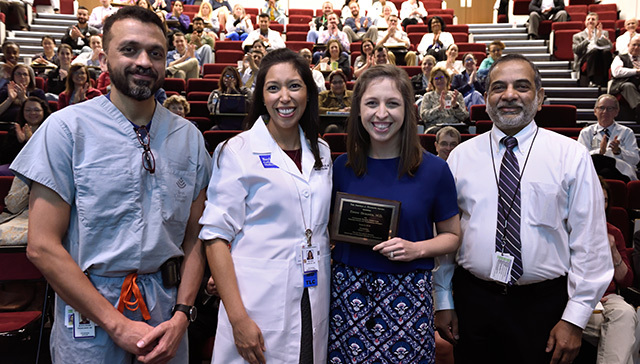 Muralidhar Premkumar (from left), Melissa Carbajal, Neonatology faculty, and Gautham Suresh, section chief (right), congratulate third-year fellow Dr. Erynn Bergner, as the 23rd annual Arnold J. Rudolph Memorial Grand Rounds award recipient. The award recognizes third-year fellows in neonatal-perinatal medicine for outstanding teaching, patient care, scientific inquiry and professional integrity. Eduardo Salas, PhD, professor of Psychology and Chair of the Department of Psychology at Rice University, was this year’s invited speaker at the recent grand rounds.